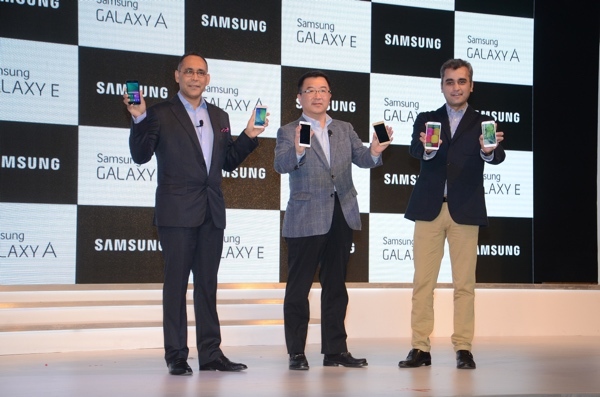 At a media event in Mumbai, Samsung announced a total of four new devices for Indian customers: The Galaxy A3, Galaxy A5, Galaxy E5 and Galaxy E7. The metallic chassis Galaxy A3 and A5 are already available in a few countries, but this is the first time Samsung introduces the Galaxy E5 and Galaxy E7. All four phones have unibody design, with the A-series having aluminum unibody and the E-series having polycarbonate unibody. All phones also have dual SIM support and run on Qualcomm Snapdragon 410 SoC. All four run on Android 4.4 KitKat with Samsung’s TouchWiz UI on top. None of them have replaceable batteries and only the A5 supports LTE. The Galaxy A3 has a 4.5-inch qHD Super AMOLED display, 1.2GHz quad-core processor, 1GB RAM, 16GB internal storage with microSD card slot, 8 megapixel rear camera, 5 megapixel front camera, dual SIM support, and 1,900mAh battery. The A5 has a bigger 5.0-inch HD display, 2GB RAM, 4G LTE, and 2,300mAh battery, with other specs being similar. The Galaxy A3 and Galaxy A5 are priced at Rs. 20,500 ($324/€271) and Rs. 25,500 ($401/€338), respectively for Indian market. The Galaxy E5 is similar to the Galaxy A3 in terms of hardware specs. There are a few differences, however. With a 5-inch 720p display, the device is noticeably larger, and there's dual-SIM connectivity on offer as well. To account for the larger display, the battery is a 2,400 mAh variant. The pricing is slightly lesser at Rs. 19,300 ($304), which may be due to the fact that the device isn't a metallic affair like the Galaxy A3 and the Galaxy A5. Like the Galaxy E5, the Galaxy E7 is similar in hardware to the Galaxy A5, and boasts a 5.5-inch 720p display along with a 2,950 mAh battery. In terms of software, all four devices come with Android 4.4 KitKat with a side serving of TouchWiz. One area of differentiation (other than the design) between the Galaxy A series and Galaxy E series is in terms of connectivity: the Galaxy A3 and A5 offer LTE connectivity, while the E5 and E7 only feature 3G connectivity. The Galaxy E5 and Galaxy E7 are priced at Rs. 19,300 ($304/€255) and Rs. 23,000 ($362/€304), respectively.